Born and raised in the St. Louis-Metro area, Ben’s interest in design really began with his love of music. In his high school days, he couldn’t wait to tear the plastic wrap off of a new cassette tape (that’s right, cassette tape) in order to soak up the visuals and layout of the insert while blaring some new music. Once an aspiring rock star himself, Ben cut his teeth as a designer while playing in his own band in Champaign/Urbana, Illinois’ thriving music scene, designing everything from t-shirts to posters to CDs for many of his friends in local and national touring bands. While in Champaign, Ben received an associate’s degree in Desktop Publishing/Graphic Design from Parkland College. 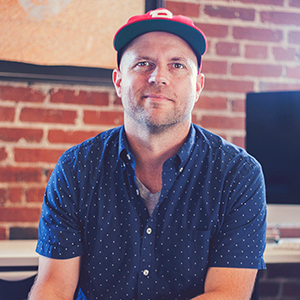 After moving back to the St. Louis area and spending almost 10 years as an account manager at the second largest beer distributor in Missouri, he returned to school to earn a bachelor’s degree from Southern Illinois University Edwardsville in Mass Communications/Media Advertising in order to set his career back on a creative path. Outside of sharpening his ninja skills here at Think Tank, Ben enjoys photography, playing guitar (and drums…sort of), squeezing in the occasional round of golf, and taking warm vacations with his wife and two young boys. Fear of spiders is arachnophobia, fear of tight spaces is claustrophobia, fear of Ninjas is called logic.